From Thursday, the 28th, with the ‘Dijous Gras’, one of the fiestas which looks better on Barcelona will be started, are you going to miss that? 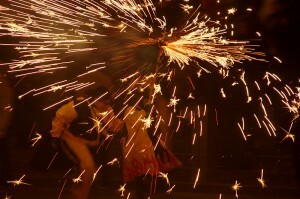 One of the favorite celebrations of the city of Barcelona is Carnival or, at least, we love the colorful of this fiesta. On Thursday, the 28th of February, all the activities, that will continue during Friday, Saturday and Sunday, are going to start in Barcelona with the famous Catalan celebration ‘Dijous Gras’. During this Thursday is practically obligatory to taste the Catalan egg sausage sandwich and a walk through the Ramblas at the sunset, the perfect scenario for the arrival of the Carnival’s Emperors. During Friday, Saturday and Sunday, the city and all its districts are going to be full of activities. So, take your bicycle and don’t miss anyone of them. You can check them on the official program (you can access clicking here). And among all this mess, don’t forget your costume, because thanks to the magic of this weekend you can be who you most desire. In order to meet a community in a close and local way, there is nothing better than participating in their festivities. This week, from the 11th to the 14th of February, Barcelona celebrates its Santa Eulàlia Festival, in the district of Ciutat Vella, a celebration full of performances which are characterized by the Catalan culture in a scene which has been the testimony of the city’s history. Castellers, giants and cabezudos, dancers, correfocs, light performances, grallers, bastoners, fairs and more activities concentrated in these four days of fiesta in the heart of the Condal City. This results in a master class about the history of these streets through the popular culture of the territory. Not only the most emblematic characters, such as the Eagle, go out to the streets, all the residents also participate in this fiesta. Being able to enter and camouflage yourself among people is, without any doubt, the best way to enjoy the city like a local person, leaving a positive mark of your visit and taking with you the best experience. After all, why do we travel, if this is not the reason? If you are near Barcelona these days, this has to be an obligatory stop.